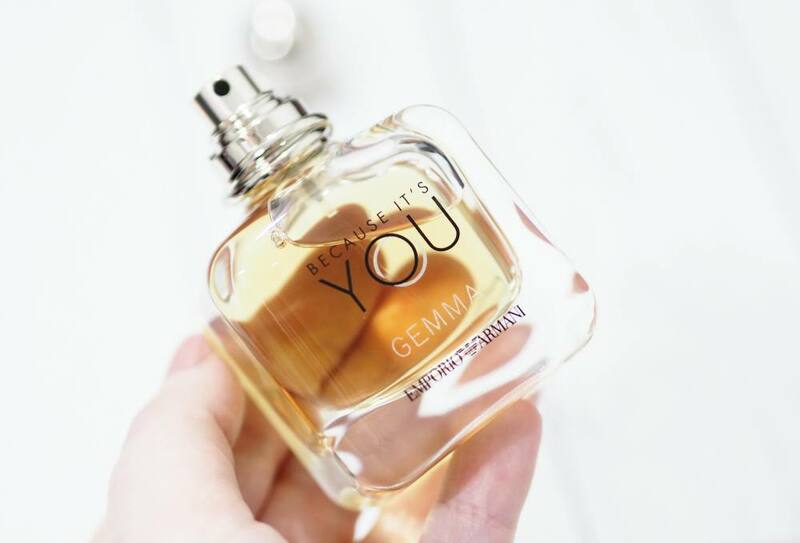 Emporio Armani Because It's You Eau de Parfum | Gemma Etc. I love the Armani fragrances, with Armani Code and Armani Si being two of my most repurchased fragrances as they’re two of my absolute favourite fragrances. I’m yet to find an Armani fragrance for women or men that I don’t like so I always like to try their new launches. I have to admit I didn’t know the difference between the Emporio Armani fragrances and the Giorgio Armani fragrances so I had to some researching to find out but it appears there are three different fragrance ‘brands’ within the Armani umbrella with the Armani Signature fragrances being the most exclusive, whilst the Emporio Armani line is their diffusion line targeted towards a younger demographic. There are two new fragrances which have launched within the Emporio Armani line; Emporio Armani Because It’s You for women and Emporio Armani Stronger With You for men. 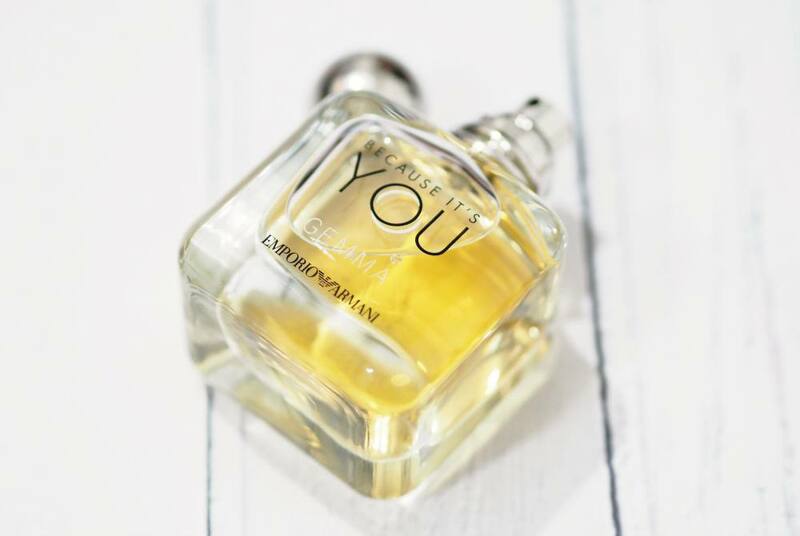 Because It’s You is happy, delicious and sparkling perfume for women: simply irresistible like a ripe raspberry in its perfect and most elegant naturalness when combined with neroli notes. What does this tantalising young woman hide in her heart? This women’s fragrance is unabashedly feminine, full, instinctive and passionate. Her charm is immediately apparent, like the addictive and sophisticated rose absolute scent. Because It’s You plays with her powers of seduction as vanilla mixes with musk, revealing a complex and incredibly deep sensuality. 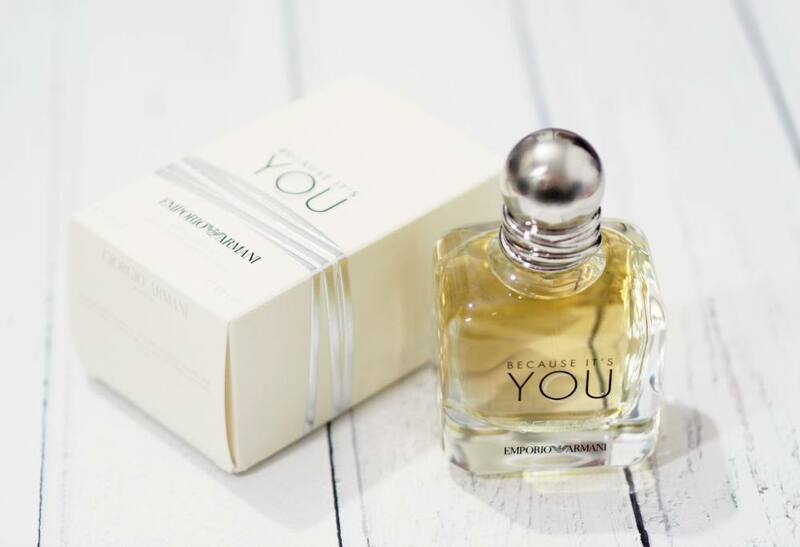 Bold and immediately captivating, Emporio Armani’s neroli & vanilla notes express the urgency of a love that takes every chance to declare itself: BECAUSE IT’S YOU. Discover the power of two with Stronger With You – For Him. Along with Emporio Armani’s Because It’s You – For Her, the two fragrances have an alliance which balance & empower each other, as a symbol of powerful love. The Emporio Armani Because It’s You Eau de Parfum is available in 30ml, 50ml and 100ml sizes from the Armani website. The bottle is simply stunning with thick, clear glass walls, silver circular lid and intertwined rings around the neck of the bottle. I really like the message behind the two scents in that the female and male versions complement eachother which are like a modern version of the iconic Emporio Armani for Her/for Him fragrances. If I had to compare Because It’s You fragrance, I’d have to liken it to Giorgio Armani Si as they’re both vanilla based scents with middle notes of rose. Because It’s You is quite sweet and I don’t know why but on first spritz I really can detect peach or nectarine yet they don’t appear in the notes so maybe I’m just strange but I love how intensely fruity it is to begin with but it’s a sophisticated fruitiness, and not the kind of fruitiness you’d associate with a celebrity fragrance. I would describe Emporio Armani Because It’s You as being fruity, sweet and a little musky and lasts for such a long time on my skin. I tend to find fruity scents not to last very well on me, but this scent definitely lingers and I can still smell it in the evening after wearing it all day and the atomiser on the bottle is quite generous so I only need just one single spritz. In my opinion it’s not an overpowering fragrance, and lends itself well for both day and evening wear, and although it’s definitely sweet it’s more of a sophisticated sweet scent and I get compliments everytime I wear it. If you like Si, I urge you to try Because It’s You as I really do think you’ll love it as much as I do as it’s beautiful. I’d love to know what your favourite Armani fragrance is?